I own a 2015 Mustang GT. It's very fast and loves to get thrown into corners even when the road is rough. On top of that, I am averaging 23 mpg on a 60/40 mix of highway/city driving. In terms of balance between sports car/comfortable car it's perfect for me. In fact it does everything better than the 1965 Mustang I occasionally got to drive as a kid. So, would I trade my 2015 Mustang GT in on a NOS 1965 Mustang Fastback V8? Yep. But it wouldn't be my daily driver. 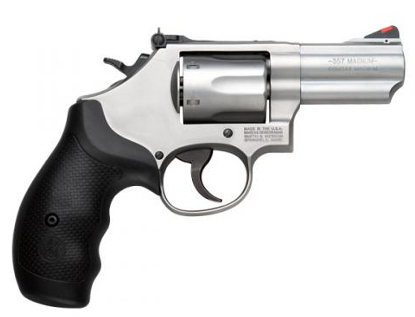 I mention the Mustang conundrum to frame my review of the new Smith and Wesson 66-8 2 3/4" revolver. Being a Smith aficionado, I've owned many Model 66s over the years. I understood their limitations with respect to shooting full power .357 magnum 125 grain bullet loads et cetera. (Those old K frame .357s had a shaved forcing cone and could be damaged by too much heavy load use). This new 66-8 has no such limitation. In fact the crane locks into the frame with the help of a ball bearing detent, locking it up so tightly when you close the cylinder that you literally need to push the cylinder to get it to open. I really wanted to not like this revolver. The two-piece barrel from the top down doesn't look quite true. I think this is merely an optical illusion. That said, the timing of the Model 66-8 is perfect. Thumb back the hammer as slowly as you can and just try to get the hammer back before the cylinder stops. You can't do it. Go shoot 300 full power.357 magnum 125 gr JHP loads through it and try it again. I'll bet it's still in time. I tried it! The Model 66-8 also features a full-length ejector rod which very positively ejects .357 magnum cases even when the cylinders start to get gunked up a bit. The accuracy of the Model 66-8 was very good as well. I could manage the trigger in double action easily and kept my groups in the 10-ring at 10 yards. I could shoot this revolver better double action than all my classic Smith .357 magnums. Shooting single action offhand, the break was very clean and light and I could drill out the x on the X-ring on a B-27 target. 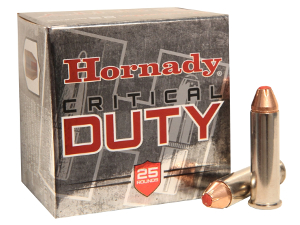 The 66-8 liked Hornady and Federal self-defense .357 magnum loadings particularly. The action on the Model 66-8 was different than my old Smith Model 19-3 2 1/2" but smooth and crisp in it's own way. After the installation of a Wolff standard-power mainspring it became even better. The synthetic grip on the Model 66-8 allows a good grasp of the weapon for me and my 5'2" wife. I am partial to wood grips, however, and I ran the majority of my testing with the Hogue checkered Coco Bolo Top Finger Groove Stripe Cap Grips fitted. The grips had enough bite to keep my hand in place even with .357 magnum 158 grain loads but not so much that they approached anything like being uncomfortable. I ran a combat course with the Model 66-8 and managed to shoot it quite well with .38 special target loads. I ran El Presidente while keeping my times sub 14-seconds except for those times I really fumbled with the reload. For this course I used a Galco Speed Paddle and kept a Galco belt speed loader carrier in front of the holster. I had to re-familiarize myself with reloading with my strong hand. The short, barrel of the Model 66-8 allowed me to clear the Galco leather quickly and it was confidence-inspiring to see solid hits on a B-27 target. 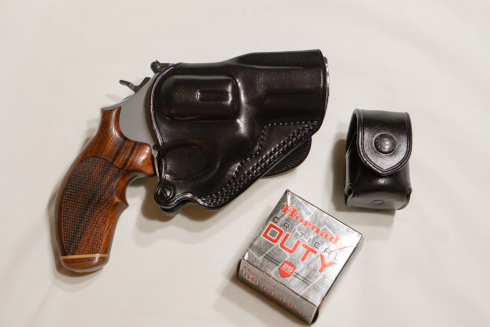 Once I'd put several hundred rounds through the Model 66-8, I cleaned it and carried it in the Galco Speed Paddle and the belt speed loader carrier. It reminded me of the days when that would have been a state-of-the-art off-duty rig. In fact, I'd say there is a case to be made that such a rig might have some advantages to any modern wondergun-Kydex arrangement. But mastering a double action revolver requires constant practice and is not for everyone. The Model 66-8's blackened trigger, hammer and cylinder release contrasts with the brushed stainless of the revolver's frame. The look is not old school. It looks, well, all business. I know the old guard who grew up thinking the 19s/66s were the last word in .357 magnum revolvers will miss the functional art of the originals. I can outshoot my beloved older Smith wheel gun with this new 66-8. It's not as pretty as my old guns but that's about the extent of it's "cons." With any carry gun, there is a greater than zero chance that your weapon will fall on the concrete or be seized as evidence etc. It makes sense then to not pack a prized heirloom. A carry gun is just a tool. I am willing to trust my life to this revolver and expect it to stand up to decades of shooting. I admit I look at the old Model 19 and I'm reminded of the days when Smith's revolvers were the prettiest girls at the dance. This new 66-8 is not a beauty queen, but she may be the smartest girl in school. 357 Magnum 135 Grains FlexLock Nickel Plate Brass Case 1275 fps 487 ft lbs 8"
I've attached the range results that are interesting for the way they show velocity loss even when going from a four-inch barrel down to a three. That aside, the thing is a little tack driver. S & W Model 66-8 with 2.75 inch barrel, 10 yards rested.